Last year I had, let's just say, a landmark birthday. I realized that life has been flying by too quickly so I decided to plan a trip to a place that I have always wanted to visit – Tuscany. I happen to come across a villa that looked as though it was wheelchair accessible and the planning started from there. I thought that organizing the trip would be simple so I decided to plan it myself. Stating it was a tremendous amount of work to coordinate is a huge understatement, and next time I think it would be wise to use a travel agent specialized in working with people with disabilities (see resources below). Arriving in Frankfurt was interesting, as they had a vehicle that was like a little bus that raised and lowered. They raised it and attached it to the plane so I exited directly level onto it then it lowered to ground level and then we drove to the airport, where they had specific waiting area designated for people with disabilities. I have mixed feelings about this "waiting room" because on one hand it was extremely accommodating, equipped with an accessible bathroom, free beverages and was private, yet i did feel slightly segregated. By this time, despite the short rest off my backside on the plane, we had been up for 20 hours in total, so I asked them if they had somewhere to lie down. I was determined not to have any skin issues from this trip, especially at the beginning! They escorted us through the airport to a larger room that had a lobby and hallway off of it with many doors. We entered through one of the doors and inside was similar to a hospital room with four beds with curtain dividers and said that I was able to rest there as long as I wanted! Okay, maybe segregation isn’t so bad after all! 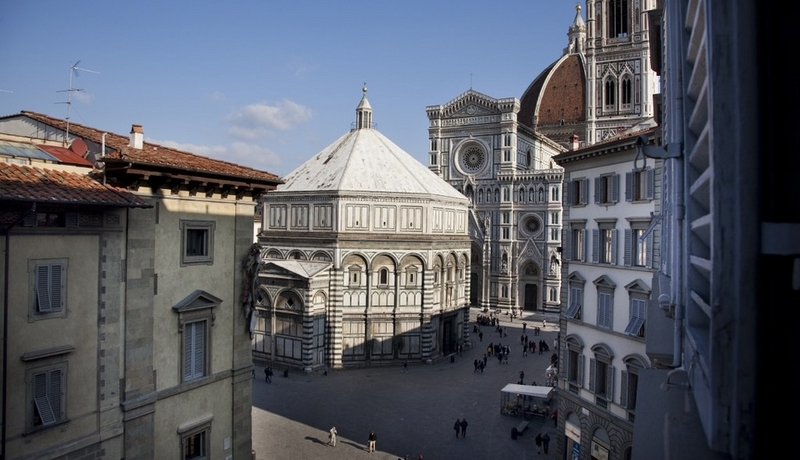 After a short rest, we had a one-hour flight to beautiful Florence, Italy. It was exciting to see the rolling hills, with villas perched on them from the plane window. The airport staff were helpful but didn't speak any English so it was tricky to communicate. I somehow.made it off the plane in one piece and then had arranged for a driver with a van to pick us up. My husband was able to lift me into the minivan and I brought a manual wheelchair that could be disassembled and placed in the vehicle. 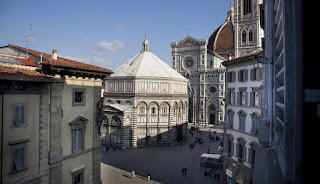 Because we had such a large group and I wanted the experience to be as authentic as possible, we rented an apartment, called "Florence with a View", right in the center of the historical city that I found online at www.homeaway.com. It was much more economical than two hotel rooms and we had a full kitchen, two bedrooms, and two bathrooms. When we were planning the trip, my husband and I were concerned about the elevator because typically In Europe, elevators are the size of a telephone booth with doors that fold in. We asked for the dimensions in advance and taped it out on our floor at home to see if we could make it work. We really weren't certain because of the doors folding in, but we decided to go for it anyway. The moment of truth came when we arrived, extremely exhausted, but with just the right angle, we squeezed in! Had my chair have been one mm wider, we wouldn't have made it! The apartment was absolutely beautiful and fairly accessible. for any wheelchair user. The only thing that saved me was a device called the FreeWheel which attaches to your foot rest and lifts your front two castors off the ground, making the ride much smoother and easier to push. You can even push over curbs fairly easily. There's no way that I would've survived the trip without it, so it’s well worth the investment! I had this great idea that we would have one night in a hotel just outside out of Florence in a small, hilltop town called Fiesole before heading to the villa. I had been in touch with the hotel in advance, getting details on the accessibility, but apparently I didn't get enough details! The same driver picked us up and took us to the hotel which was a 20-minute drive winding and winding upwards to the top where the hotel was situated. The views were absolutely stunning. What wasn't so great was the fact that I saw two flights of stairs to get to the hotel entrance! They assured me that they have a stair lift which, of course, decided not to work. Even though they had tested it earlier on, they had a power outage that day and it was not cooperating. After an hour or so (and we were starving) two of the men from the hotel and my husband carried me in the chair up many, many stairs! They were very accommodating, but it really was not the best choice of hotels. After seeing the area, I don't think there were many that were very accessible in the small town. A distant relative of my husband's grew up in Italy,and he arranged for us to have a wheelchair accessible van (Crafter Volkswagen) delivered through a nonprofit organization called Paraplegici Livorno. There was some miscommunication regarding when the van was to be delivered in Florence instead of at our hotel, but they resolved the problem and delivered it a few hours later than planned. (It is easy for things to get misconstrued when dealing with people directly, as many of them speak broken English.) The van was equipped with a lift and could seat seven people plus the chair! Surprisingly, it was also much more affordable than a regular rental minivan. Once we had a very late lunch, we decided to drive into the heart of the town, which was an eye-opening experience. I guess I didn't think things out thoroughly and quickly remembered that I am afraid of heights! Our van, which seemed so top-heavy and large, was winding around these narrow roads (without guard rails) going up and up to the town. We didn't see parking right away and continued on and next thing we knew, we just kept going up and up with nowhere to turn around. (Note: This will be a common theme throughout the rest of the trip!) Finally there was a little area where we could pull off – I have no idea how my husband managed to do a U-turn because my eyes were closed the entire time. Since it was late in the day, the parking started to become available and we found a spot. (I tried to find out the handicap parking laws in advance but found it very difficult to get a concrete answer. Something about calling a number first… I gave up and we just parked and regular parking.) It wasn't even easy to get out of the vehicle as we are parked on such a steep incline. I was starting to think the day was going to be a total bust, but then we noticed a museum next to where we parked. The museum entrance was basically a gateway to the Etruscan-Roman Archeological ruins that dates back to 9th-8th Century BC. We bought tickets, for I believe eight euros and mine was free. Okay, here is the ironic part – the ruins were the oldest yet most accessible place that I visited the entire trip! Because the ruins are on the side of a hill, we looked down on them. 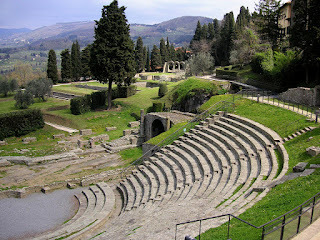 There were many stairs to a small theater that the Romans had built and baths which I could see perfectly fine from our vantage point, but then we realized that there was wheelchair accessible path weaving around them and elevators to take us back up. We were the only ones there and it was truly a unique and almost spiritual experience. Definitely one of the highlights of the trip! Then we left and went to a couple shops before they closed that featured local artists and had beautiful pottery and jewelry. It was tricky pushing me around here because it was so steep, but thankfully I have plenty of help and we managed. By this time, it was already 7 PM and we were hungry. My husband asked a local where there was a good nearby restaurant. (Also, know that most shops and restaurants have a step to get inside, so a manual chair is the only way to go unless you have a specialized wheelchair ) We were the only ones in the restaurant again as eating at 7 PM is quite early for the Italians but worked out well for us as we had great service everywhere. I thought I would go the bathroom once we got there as most places we visited did have accessible bathrooms but, unfortunately, this one did not. There was a large flight of stairs going down and the waiter insisted that he could carry me down the stairs, but looking at how narrow and steep they were, I declined his offer. At the table, my sister passed me a wipe to clean my hands since I couldn't reach the restroom. Next thing I knew, the waiter placed a large bowl in front of me with warm soapy water to wash my hands with a towel! I noticed over and over that the people would go out of their way to help which made up for the lack of accessibility. Our last leg of the journey took us to our villa named “Rosa dei Venti” which I rented through a British company called “Tuscany Now”. It was approximately a one-hour drive from Florence outside a medieval village called San Gimignano. I have to tell you that if I could have held on, this drive would have been yet another white-knuckle moment! The scenery and views were so incredible though! We were met by the most adorable couple who are the owners of the villa, Graziella and Fernando. They spoke minimal English but we managed to communicate and discovered that they had been married over 60 years and Ferdinando had built the villa that we were going to stay in! It was quintessential Tuscany with wood beams, terracotta floors and was surrounded by fruit trees, olive trees and vineyards. The house is one floor, the master bath extremely large and once again a large tub with a hand-held shower. When we first arrived, I vowed that I would not be leaving the house for a week since the drive to it was so terrifying, but after a night's rest, we ventured out and visited the closest town, San Gimignano. When I had left United States, I realize that I had a bladder infection and I was prescribed an antibiotic. I finished the antibiotic about the third day into the trip and around the seventh day I noticed that it was getting symptoms of another infection! I had thought that we had packed some Cipro, just in case but it was nowhere to be found. (Another important note: ALWAYS bring extra medication) I started to stress out as we were really in quite a remote area and I wasn't certain how I was going to get a prescription. We decided that my husband would go visit Graziella and Fernando and see if they had any suggestions. My husband wrote out my questions to them in Italian that we translated on our iPad and headed up the steep driveway which connected to their home. Within an hour of my husband leaving, a doctor arrived at the villa! I was in complete shock! I was relieved but then part of me was wondering how much is this going to cost? We had purchased health insurance but I had a feeling it wasn’t going to cover house calls. He spoke fairly good English and I explained my problem to him. He immediately wrote me a prescription and assured us that there would be a pharmacy open on a Sunday as every village makes certain to keep one open. (Many of the shops and restaurants keep odd hours so it was a huge relief to know!) After filling out some paperwork, I asked how much it was going to be and he stated only €25 (which converts to less than $30 US). If I could have a doctor come to my house at any time in the United States for $30, I don't think I would ever go to another doctor's office again! After he left, all the women on the trip stated that they were starting to not feel well, as not only was the doctor helpful and efficient, but extremely handsome! Got to love Italy! We had many days of shopping, visiting wineries, and sightseeing (which always include more shopping!). We had one night in which “Tuscany Now” arranged for Graziella to make us a typical Tuscan dinner which was more like a feast! She made crostini (small toasted bread slices) with three different toppings, bruschetta, salad, eggplant Parmesan, two kinds of pasta, chicken with roasted potatoes, roasted pork with peas, a tray of freshly picked figs and grapes from the property, a pastry with apricot jam (of course homemade with the apricots from the property as well!). The meal came complete with two bottles of wine; one of the bottles was Fernando's own blend from their vineyard. Also on one of the evenings, Graziella invited us to have a tour of their small farm. Her grandsons were there and one of them spoke very good English and guided us around the property. After the tour, Graziella had more crostinis rubbed with fresh garlic and then poured thick, beautiful yellow colored organic olive oil on top that was made by their grandson with their own olives, topped with a sprinkle of pink sea salt. So simple yet divine! There were so many places and things to fall in love with in Italy that I cannot begin to list them all but I especially adored the people. It was difficult not to be envious of their laid-back attitude, zest for life and passion for all things pure and old-school. How did we stray so far from the basics? Does our “rat race” pace result in a better quality of life? I think not. The night before we left for our flight, Graziella and Fernando came to wish us goodbye. Graziella gave us each a small little sachet of fresh lavender from the garden. We realized that we had fallen in love with these two and saying goodbye was not going to be easy. We all exchanged hugs and the little Nonna (grandmother) came over to me and held my face with her worn, hard-working hands, looked at me with her clear, bright, blue eyes and kissed me on the cheeks and said "Bellissima". We all had tears in our eyes. As they went out the door, immediately in my mind, I was planning my next trip back!